if you interested in seeing the movie this link can give you an option. Search for Free Fall, you can see the movie with subtitle. Thank you, Sophia. I haven't tried the link, but I hope people will use it to see the movie. On another subject, we may have to start a "German as a second language" thread! I was looking at German for Dummies online - how many words are there for "the" anyway? So far I've found das, der and die, and don't know when it's right to use which one. And just learning to speak isn't enough, it's knowing what someone is saying to you that is the harder part, I think. Mark Twain said "Life is too short to learn German". "It took me roughly four to six years. I've been here 29 years and still don't get the der, die and das." "I married a German and moved here 11 years ago (okay, we did spend five of those years in the US) and I still can't keep up with Germans in conversation. Part of it may be that I've had to learn German and Bavarian at the same time, but still, the word order and the du/Sie thing do my head in. And really, how many words for "the" does any language need?" "I really think there are as many rules as exceptions in the German grammar. I think learning German for four months required more brain power that getting my engineering degree. " Learning the German language is difficult. At school everybody hated it. The language is schön but the grammar is really terrible to learn. Hi Penthesilea, thank you very much . Are you planning to watch freier fall? So you are German. Then you might be the Max Riemelt expert. Do you know if he really is a celebrity in Germany? I love German. I learnt it for 4 years at High School then took it in my first year at University. Unfortunately I dropped it after 1 term as I had too heavy a load. I then failed French so decided not to be a language teacher Instead I taught Geography and Economics and that was all 50 years ago. I can read French better but my accent is terrible and I find German announcements on trains easier to follow. Actually once you learn it, German sentence structure is more regular than English. English always has so many exceptions to the rule. For us native speakers we do not notice. In German, the main verb is always second but any other verbs are at the end of the sentence. It is best to learn der/die/das along with the word. The strange thing is that girl (Mädchen) is das or neuter but that is because all nouns with "little" chen or lein attached are neuter. French structure is more like English so it is easier to translate as you go. Anyway I had better shut up before I make a fool of myself with native German speakers. This is an interesting site (link below), but the videos are 15 minutes to watch - a Chinese-American married a German girl and was determined to speak German so he could talk to his in-laws. It's a very cute story, and after 3 months, he taped a 20 minute conversation with his FIL, not perfect, but pretty damn good. "Until Julia, my father-in-law (Papa), and I went on an epic 8-day, 96-mile hike, climbing 9,186 feet through the Austrian Alps (at right). Since Papa cannot speak a word of English, Julia was doing all the translation during the entire hiking trip. I just thought that it was not very cool on my part. Even though Papa took me to a torture museum the first time I met him 8 years ago, he had accepted me, a Chinese American, into his traditional Austrian family with open arms. So by the end of our hiking trip, I decided that it was finally time for me to learn German. After I came home from the trip, I started doing research on what is the best and fastest way to learn a new language." can you please help me with subtitles again? Right before this scene where Kay comes up after Marc in his car and they argue on the side of the road. Kay tells Marc that he should just admit to being gay. 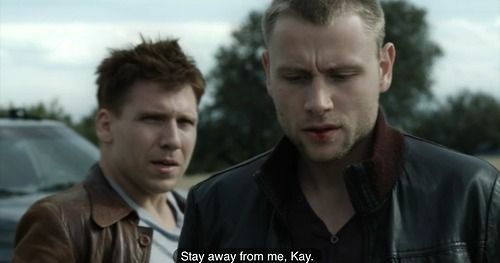 But then I’ve seen 2 different subtitles of what Kay says to Marc, right before he hits Kay. What does he really say to Marc? Can you image? I saw that movie at least ten times but I never noticed that kay said something.